The revered shrine of Gangotri, situated at an altitude of 3,200 mts. about sea-level amidst sylvan surroundings, constitutes one of the most important pilgrimages for the devout Hindu. Visited by hundreds of thousands pilgrims every year, this 18th century temple constructed by Gorkha General Amar Singh Thapa, is near the spot where the goddess Ganga is said to have first descended on earth from heaven, in answer to the prayers of King Bhagriath. Lord Shiva received her into his matted locks to break the great force of her fall. From there it emerged into many streams and the one which started from Gangotri was called Bhagirathi. The Pandavas, it is said, came here to perform the great 'Deva Yajna' to atone for the death of their kinsmen in the epic battle of Mahabharat. 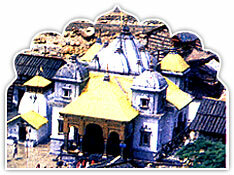 The temple itself is situated on the right bank of the Bhagirathi . There are a number of Ashrams locked on the other side of the Bhagirathi. (18 km.) - the source of the Bhagirathi for a dip in its icy waters is dip in almost a must for pilgrims; and to the temple of Bhairavanath at Bhaironghati, (10 km.). GMVN Tourist Bungalow is located at Bhojbasa, about 14 km., from Gangotri, on the road to Uttarkashi, at the confluence of the Jat Ganga and Bhagirathi rivers. 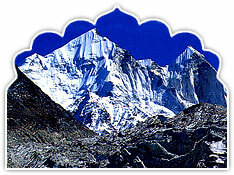 Pilgrims also trek to Nandanvan (6 km) and Kedartal (18 km) from Gangotri. Gangotri is well connected to other parts of the country through air, rail and road. The nearest airport is Jolly Grant, 26 km. From Rishikesh, 249 km. The local and State Transport bus services also connect Gangotril with many centres in the region while porters and ponies are available for excursions to Gaumukh and other places from Gangotri during the yatra season. The temple remains closed from Nov. to April due to severe winter conditions.